Dental amalgam is a filling material that has been used by dentists for over 150 years. A mixture of metals that typically includes silver, copper and tin, dental amalgam fillings (commonly referred to as “silver fillings”) also contain mercury, which has raised safety concerns among patients from time to time. In response to those concerns, the U.S. Food and Drug Administration (FDA), American Dental Association (ADA) and other organizations have conducted numerous studies over several decades and have repeatedly found that the small amount of mercury released during placement and removal of amalgam fillings does not cause adverse health effects. Amalgam fillings remain a safe, cost-effective and durable choice when it comes to the restoration of decayed teeth. Why is amalgam still used to fill teeth when composite materials are available? While composite (or “tooth colored”) fillings are more durable than ever thanks to advancements in technology, there are still many cases where amalgam fillings perform better (and longer). This is often the case with teeth that are naturally subjected to extensive chewing force, such as molars. Mercury is an important part of the amalgam mixture as it contains unique elements that allow it to be manipulated with ease during placement and then harden quickly after. In addition to the benefits of longevity, amalgam fillings are also more affordable than composites. What concerns are there with mercury and its effects on the body? Mercury is a naturally occurring metal and one that we are exposed to in small amounts through water, air and food throughout our lives. Excessive exposure to mercury can negatively affect the brain and kidneys – however, it is important to understand that amalgam fillings do not cause dangerous levels of mercury exposure. Numerous scientific studies and thoughtful research have led the FDA to stand behind its position: amalgam fillings are a safe and effective restoration method for patients over 6 years of age. What is the ADA’s position regarding the use of silver amalgam fillings? 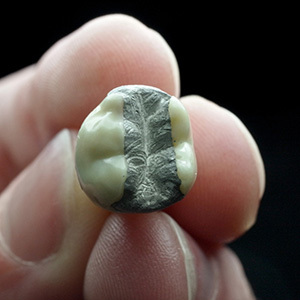 A thorough summary of evidence ranging from 2004-2010 led the ADA to reaffirm its position that amalgam is a valuable and safe choice for patients. When is it appropriate to use composite fillings? Composite fillings are typically made of a resin and glass mixture, tinted to the color of your tooth, and commonly referred to as “white” or “tooth-colored” fillings. They serve an important purpose for teeth that are visible when smiling, providing an aesthetic benefit not afforded by silver fillings. While resin composite fillings undoubtedly look better than amalgam ones, they are generally considered to be less durable, and therefore may not be ideal for teeth that are subject to extreme chewing and biting forces. It is worth noting, however, that composite materials continue to benefit from technological advancements, contributing to enhanced durability. The ADA supports composite materials in small or mid-size fillings on teeth that are exposed to moderate pressure from chewing, and acknowledges that they are a good choice for a more natural-looking filling. The ADA Council on Scientific Affairs has concluded that both amalgam and composite materials are considered safe and effective for tooth restoration. If you still have concerns about amalgam fillings, please don’t hesitate to call our office! It is important to us that you fully understand all available options when it comes to your oral health.